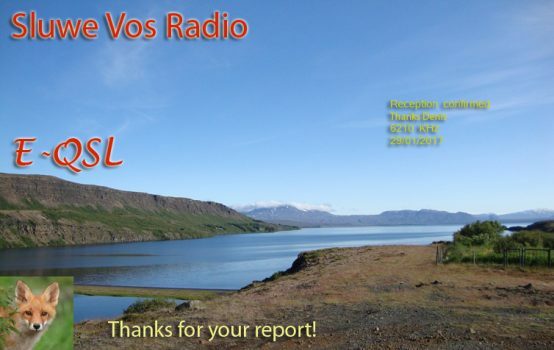 eQSL from Sluwe Vos Radio transmission of the 29/01/2017 on 6210 kHz AM. Report sent to [email protected], eQSL in 49 days. 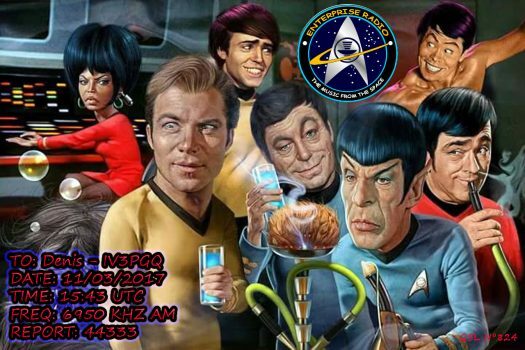 eQSL from Enterprise radio transmission of the 11/03/2017 on 6950 kHz AM. Marconi Radio International paper QSL received for various reports sent to [email protected] on 2015/16/17. eQSL from Radio Casanova transmission of the 04/03/2017 on 6240 kHz AM. 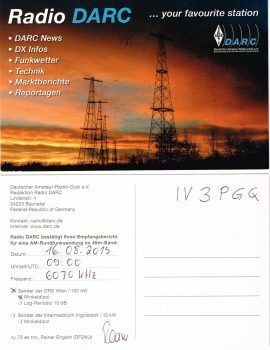 Radio DARC paper QSL received via bureau for reception report sent to [email protected] the 16/08/2015. 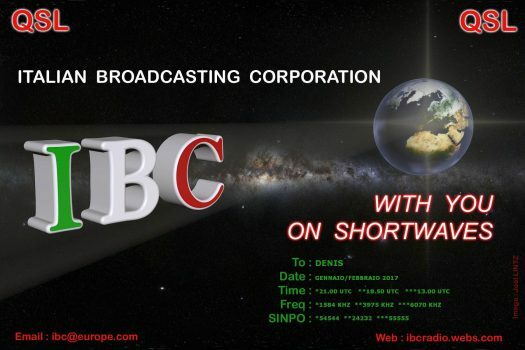 eQSL of I.B.C. Italian Broadcasting Corp. various transmissions on 1584/3975/6070 kHz AM. 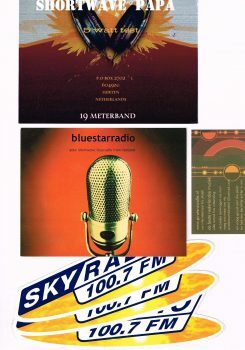 Paper QSL’s and stickers from Bluestarradio transmission of the 07/02/2016 on 3900 kHz AM. 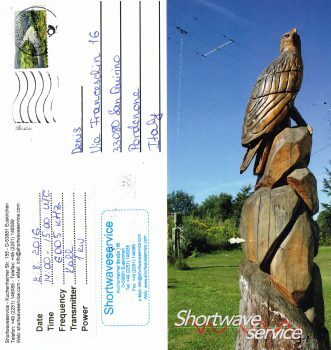 Paper QSL from Shortwave service, R.700 transmission of the 02/08/2016 on 6005 kHz AM. 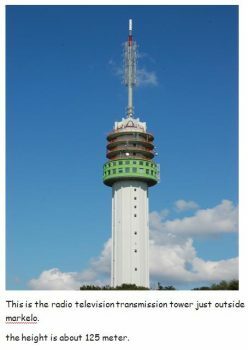 Report sent via [email protected], QSL in 219 days. 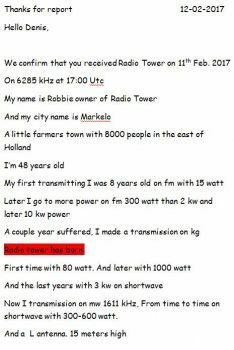 eQSL from Radio Tower transmission of the 12/02/2017 on 6285 kHz AM. 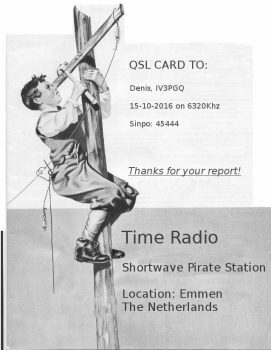 Report sent via [email protected], QSL in 19 hours. 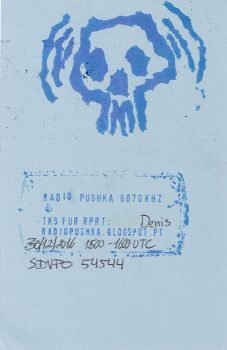 Paper QSL from Radio Pushka transmission of the 30/12/2016 on 6070 kHz AM. eQSL from Radio Spaceshuttle International transmission of the 23/12/2016 on 6070 kHz AM. 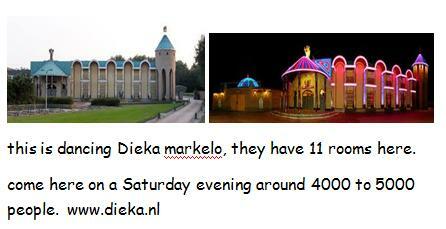 Report sent via Facebook, eQSL in 1 day. Special Christmas eQSL from Pink Panther Radio. Transmission of the 11/12/2016 on 6803 kHz AM. 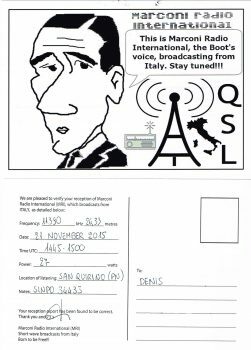 Report sent to [email protected], eQSL in 2 days. 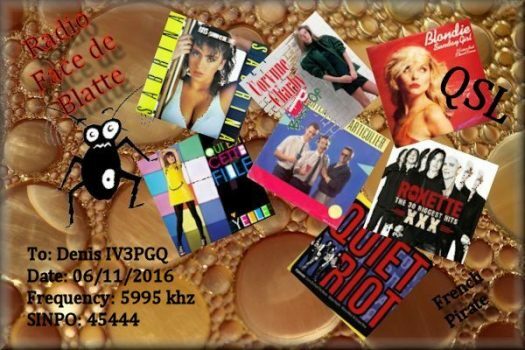 eQSL from Radio QBC International transmission of the 26/03/2016 on 6965 kHz AM. Report sent to [email protected], eQSL in 260 days. 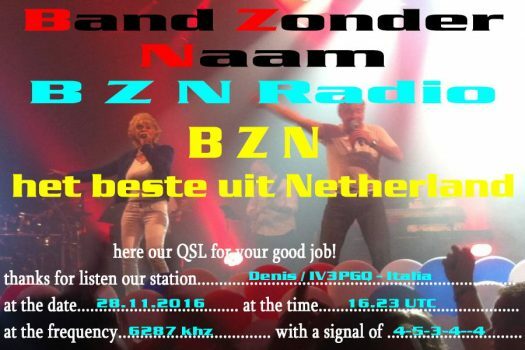 eQSL from BZN Radio transmission of the 28/11/2016 on 6287 kHz AM. 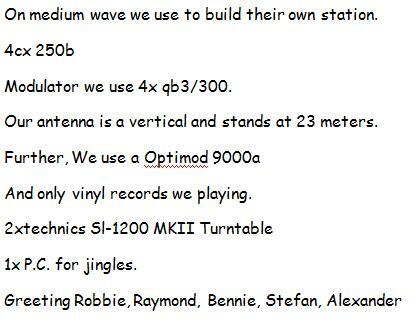 Report sent to [email protected], eQSL in 10 days. eQSL from Time radio transmission of the 15/10/2016 on 6320 kHz AM. 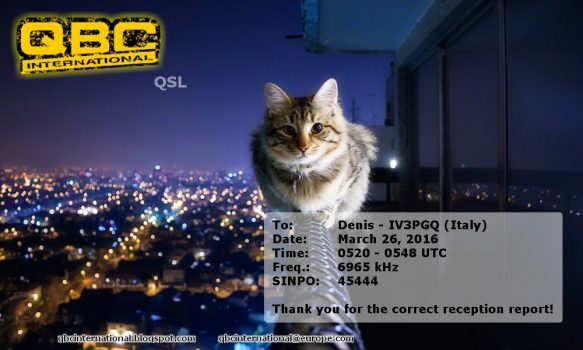 Report sent to [email protected], eQSL in 50 days. 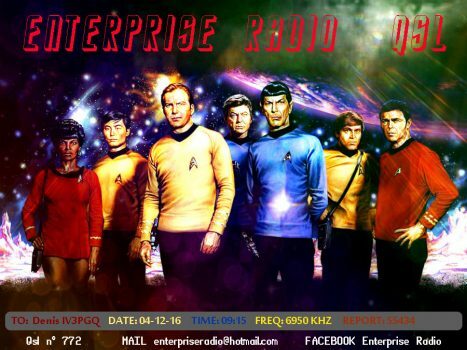 eQSL from Enterprise radio transmission of the 04/12/2016 on 6950 kHz AM. Report sent to [email protected], eQSL in 5 hours. 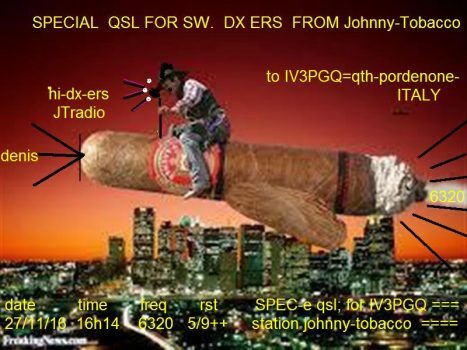 eQSL from Johnny Tobacco transmission of the 27/11/2016 on 6320 kHz AM. 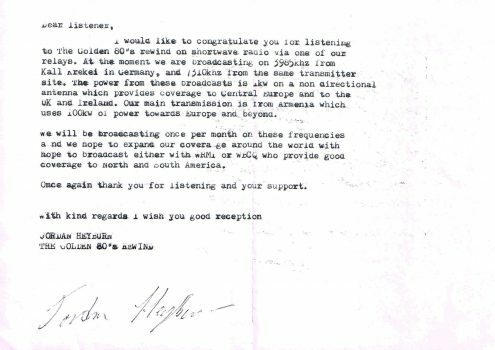 QSL from The Golden 80’s rewind transmission of the 06/11/2016 on 6175 kHz AM. 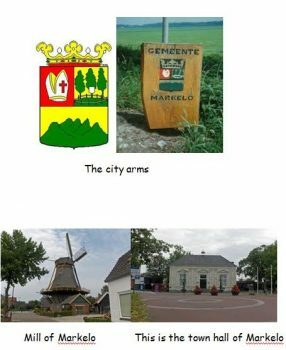 Report sent to [email protected], letter – QSL via postmail in 16 days. eQSL from Halloween Radio transmission of the 01/11/2016 on 3935 kHz AM. Report sent to [email protected], eQSL in 18 days.